. Estate Auctions Services | Property Estate Auctions | MOVING ON! 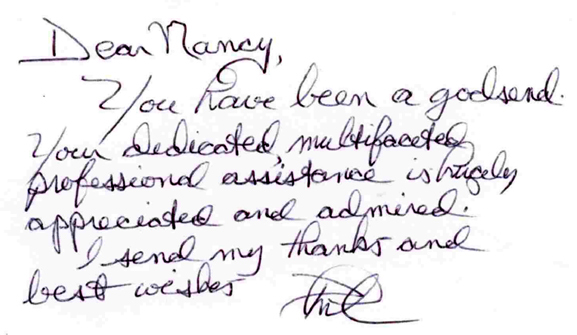 Please take a moment to read some of the wonderful notes and comments made by our clients; that we greatly appreciate they taking the time out of their business lives to send us their heartfelt thank you notes. Joy and I can’t thankyou enough for all your help in settling our mom’s estate. You took a job that we could not imagine getting through and made it bearable! Everyone helping has such a good disposition- that really helped a lot. Thanks again for everything. I realized that I failed to follow up with you about a referral to Nancy Alberts. I need to tell you that I owe you a debt of gratitude for the referral. 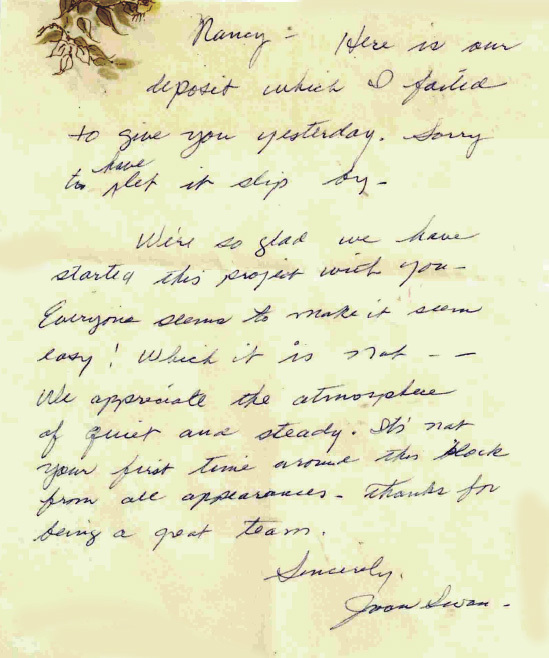 I contacted Nancy with the express purpose of finding a collaborative arrangement for borrowing/storing furniture at her disposal in my home, if possible. I thought it was worth a try to see if we could mutually benefit from the arrangement. As she pitched me re her services I realized that what I really needed…and wanted was what she had to offer: minions. Her minions were little miracle workers. They took my copious and beloved belongings and made them disappear into various destinations. They did it all in less than four days and they did it under the quoted amount. And they didn’t make my life miserable. Furthermore, at no time did I feel as if I was inadequate for not being able to do this all on my own. I honestly do not know how I would have managed without Nancy and her minions. This moving thing is a bigger physical and emotional strain than even I, in my global panic over the mere thought of it, realize. I believe that either my daughter (who was giving up her life to be there to help me, bless her pointed little head) or I would have ended up hurting each other if we had had to finish the job we had already spent so much time starting. Nancy’s calm prevails throughout the process. But make no mistake, she is driven to get it all done. I honestly do not know how I would have managed without them. I know that either my daughter (who was giving up her life to be there to help me) or I may have ended up recruiting seconds for a duel had it not been for Nancy’s help. Thank you for saving us both. 1) When it comes to organizing a move out: One person does one unit of work. Two people will be able to do three units of work. Three people do 4-5 units of work. So, get helpers. One sorts (that’s you), one packs the boxes, the third moves the thing from the sorter to the packer and moves it out of the way of the packer. Trust me, this is the formula. 2) As an exercise in futility inform your children that they must come and get their stuff before the move out. Repeating this appeal will not improve your results: they won’t do it. They may tell you to just toss everything knowing that if you could have done that their stuff would already be in the landfill. They have the upper hand and they know it. There is no way you are just going to toss their soccer trophy from middle school any more than you would dump your cherished set of nuts, bolts and Elmer’s glue candlesticks they made as a kindergartner for Mother’s Day. Pack their stuff up and send it to them…as a surprise! If you warn them they may refuse delivery. 3) Pull out everything of a kind of thing before deciding what to keep. When you realize that you have six 9×13” pyrex casseroles or three virtually identical black leather purses that can be worn as backpacks (the revelation being that you apparently have a memory loss and a love of black purses/backpacks) it is easier to get rid of most of them. 4) Set up the pickup of your discards and donations before you even start packing. They don’t just come when you whistle. Trust me, you will second guess your decisions if your stuff is still there staring at you. 5) Almost everything we need fits into an amazingly small space. The rest is superfluous. Send the excesses their way and smile that you are doing the right thing (your children will thank you posthumously). 6) Take photos of the precious things you want to keep but shouldn’t. That amazing letter from your son’s 6th grade teacher extolling his many talents and virtues that is so dear to you (not so dear to him or he wouldn’t be telling you to trash it even though you know that his children will love reading it some day) has no place in your new home. And, you’ll never have the chance to see it again because it will be buried amongst all the other wonderful memories. a) Take a photo of it. b) Dump it in the trash. c) Empty trash ASAP. 7) As a child, when I needed to de clutter my room, I made separate piles destined for different recipients: this to my brother, that to my sisters. I was always able to purge if I knew that my things were going to a loving home. Find the charities that appeal to you (I chose Dress for Success and a woman’ homeless shelter a my prime recipients). Seeing my things go to people who would honor them in their lives made it incredibly easy to send them away. 8) If you are a sentimental fool, as I am, you may have to spend some time with your things before sending them on their way. Put aside the special things that need a final look until after your minions are done for the day. This is a surprisingly exhausting process and you will slow it up and frustrate your helpers if you spend time with those things while they are working with you. Thank you for all of your wonderful, expert, compassionate help & advice. We’re getting there! Again, thank you for all your help! Thanks again to you and your “quick move team” for the great job you did with my folks. Thanks again. I was very pleased and could not have trusted that with just anyone when all the things that required additional attention on my part to make the admission happen, timely. You are a true friend and real gem of a human being. I am glad I can call you a friend. Chris of Divine Movers was really put to the test to move me in the heavy rain and ice storm! He was great and well worth your recommendations. I want you to know that I certainly appreciate the advice you used in getting me “on the move”. If I had a million $’s, I’d bestow it gladly on you – a person whom I admire very much. Can’t thank you enough -You made our move run so smooth!! Moving day, moving things for the auction and cleaning the house. You were wonderful to work with! I’ve really settled in to this condo thanks to you and your team it was easy. I absolutely love it here. Hopefully I don’t have to move again locally but if I do I will be sure to call you. I will also highly recommend you to anyone who needs a move like mine. On behalf of the Board of Directors of Ramps Across America, Inc. I would like to thank you for your generous donations. It is businesses like yours that made our first event so successful. We will be repeating it next year. Thank you again for helping us continue our mission: “Building Independence One Ramp at a Time. MOVING ON! First visits are always free. We are committed to our clients and families of loved ones, helping them feel completely at ease knowing that they are being looked after the way a family member would look after them.